At a discussion on the forthcoming book, “Rethinking Public Institutions in India” being published by Oxford University Press in May, held this evening in New Delhi, Chief Economic Adviser, Ministry of Finance, Government of India, Arvind Subramanian wondered whether India is a democracy or a judiciocracy, which implies that the country is run by the Judiciary. Saying that India is becoming a highly litigious society, with Government being the major litigant in many cases, he asked whether this made honest bureaucrats risk-averse. The book is edited by scholars Devesh Kapur, Pratap Bhanu Mehta and Milan Vaishnav. 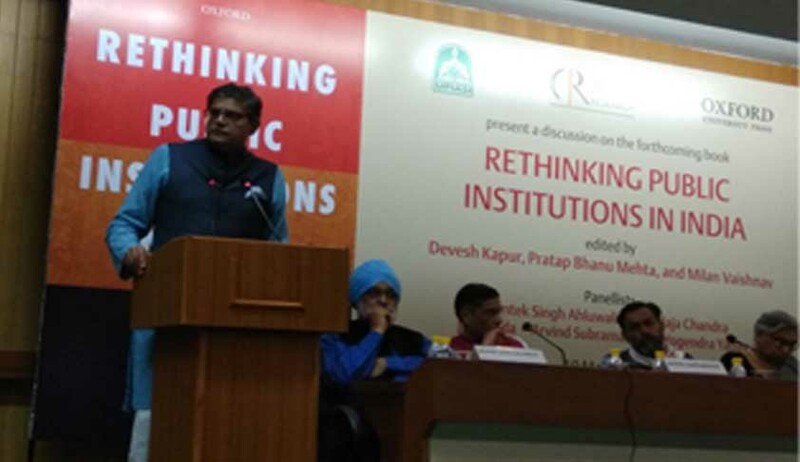 Speaking after Subramanian, Jay Panda, Member of the Lok Sabha, said that with 36 political parties in the Lok Sabha, consensus is not the way to run the House. Emphasising the relevance of rules, he said he had proposed tweaking of many of them, to suit the current times. Describing the NJAC as a superbly crafted legislation, he said it was a tragedy that the Supreme Court struck it down. Raising the issue of political funding reform, Panda said control of expenditure by candidates in an election does not work. ‘It does not achieve its objective of level playing field’, he said. Referring to the lowering of cap for anonymous donations to political parties to Rs.2000, he said not recognising that it will make it harder is not good. He claimed that when the Election Commission proposed the same reform, all supported it; when it was implemented, however, it was called frivolous. He said it was nothing but hypocrisy. He said there is need to empower the Election Commission more. Swaraj India leader, Yogendra Yadav said the answer to the question whether public institutions have improved over the years is not uplifting. Saying that instruments to regulate institutions are coercive, Yadav said that was why he had opposed one big Lokpal, with too much powers. Yadav expressed the view that political interference in institutions is reciprocal, that is, institutions sought political intervention, and they were indeed in need of such intervention. Institutions like the Medical Council of India, and AICTE were running huge rackets, in the name of education, he lamented. Yadav emphasised the need for long-term institutional mechanism, and regretted that the Governments do not want it. Instead, they look for short-term gains, recalling his experience of preparing a report on the Equal Opportunities Commission, which was junked by the then Government, because it did not agree. He wondered how periodical elections and Kumbh Mela are routinely held, while the routine requirements of governance are ignored. Former Deputy Chairman of the Planning Commission, Montek Singh Ahluwalia, drew attention to Section 13(1)(d)(iii) according to which a public servant is said to commit the offence of criminal misconduct, if while holding office as a public servant, he or she obtains for any person any valuable thing or pecuniary advantage without any public interest. Because of this definition, he said, anybody can be corrupt, as the term “public interest” is relative, and there may not be any consensus on what is meant by public interest. According to him, on the environment said, the clearance criteria for projects, are extremely unclear, and non-transparent. He underlined the need for a much better regulatory structure. Ahluwalia also emphasised the need to make the proceedings of the Parliamentary committees public. ‘Why should the views expressed by the civil servants in the Parliamentary committee meetings remain a secret?’ , he asked and observed that even if it is televised, people would know whether the civil servants contributed to quality debates within the committees.